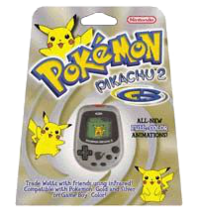 Pokémon Pikachu 2 GS is a self-contained video game. It is part of the Pokémon series. This game is an interactive Pokémon-themed pedometer, similar to its predecessor. Unlike the original game, it is no longer necessary to care for Pikachu. The game supports interactivity with Pokémon Gold/Silver and Crystal Versions, in which watts can be converted into items. This page was last edited on 23 March 2019, at 16:09.